Springray II builds on the success of its predecessor, providing you with a vintage-style spring reverb, reminiscent of analog modules form the late ‘80s. In recent years, analog reverbs have been phased out and replaced with their digital counterparts. The Springray II provides a well-needed revival of the classic spring reverb sound, with this analog module. At the heart of the Springray II are three reverb tanks (not included). 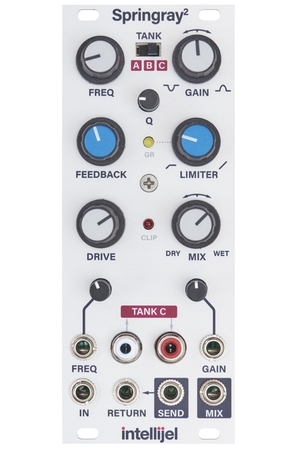 Each tank provides its own tonal character and sound, allowing you to switch between them using the three-position switch towards the top of the module. The result is a range of versatile tones and textures, which can be used on a variety of sources. One of the most intriguing results Intellijel found, was combining the Springray II with the Dixie module, resulting in a realistic cello-like sound. The Springray II features a range of enhancements and upgrades including replacing the shelving EQs with a parametric EQ. The parametric EQ boasts its own frequency, Q and gain controls, allowing you to easily sculpt your tone and sound. The CV inputs have also been replaced with inputs for controlling the filter frequency and gain. The feedback and limiter circuits have also been revamped, providing exceptional audio fidelity thanks to the redesign of the drive. The limiter circuit in the feedback path, is designed to prevent feedback from clipping the output for added protection. The module can also utilise external processors in the feedback path, routing through the Send/Return normalled inputs. The highly compact module only requires 10HP of space; a tiny footprint for such a versatile spring reverb module. The ergonomic layout features a range of retro-style attenuators, that provide optimal precision when dialling in your levels. 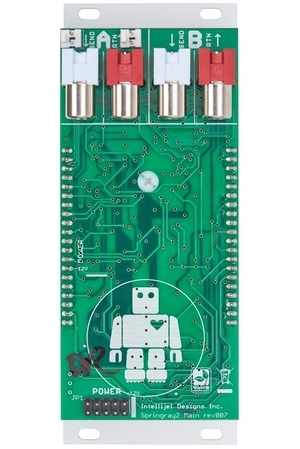 It also features a range of patch points including Frequency and Gain outputs as well as Return, Send and Mix connections. Dual red and white RCA connections are used for the Tank C. It also features a range of smaller pots and LEDs, indicating when your module is clipping.